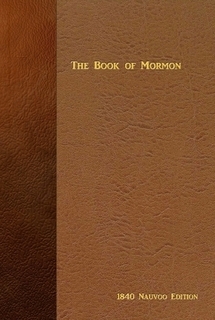 The “Nauvoo Edition” of the Book of Mormon. At some point before the third edition went to press, Joseph Smith compared the printed text of the two previous editions (1830 and 1837) with the original manuscript, and found errors made in copying the printer’s manuscript with the original. Some of those errors were restored in this 1840 edition. Ebenezer Robinson was largely responsible for the printing of this edition. He went to the Cincinnati firm of Shepard and Stearns where he ordered stereotype plates that could be used for subsequent printings. To help defray expenses, he worked at Shepard and Stearns from June to October 1840 at 25¢ per hour, with his salary going towards the printing and binding costs. When the book was advertised for sale in Times and Seasons in November, the sale price was $1.00 wholesale, and $1.25 retail. The reprint edition is available as a quality hard cover with dust jacket, or in a more economical paperback. Both editions include the original text of the 1840 edition as well as the story of Ebenezer Robinson and the amazing story of the Nauvoo Edition.